This entry was posted in Eric D. Huntsman, Luke, Luke 13, Luke 4, Luke 8, Mark, Mark 1, Mark 5, Matthew, Matthew 8, Matthew 9, Miracles of Jesus on February 17, 2015 by Administrator. By Eric D. Huntsman. 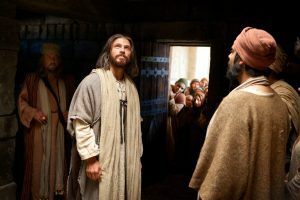 Cross-posted at New Testament Thoughts and excerpted from The Miracles of Jesus, 19-22. The divinity of Jesus that the miracle at Cana symbolized was even more clearly demonstrated in those nature miracles that are the clearest examples of epiphanies, or direct revelations of a divine identity. 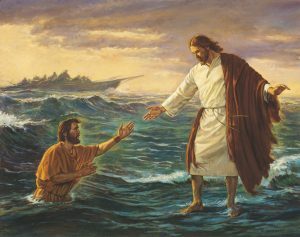 The twin examples of Jesus’ calming a storm on the Sea of Galilee and his later walking on that same body of water are striking illustrations of this because they employ common Near Eastern symbols of creation, which often involved a deity defeating the unruly powers of chaos, which were often represented with images of stormy seas. But more importantly, because the Hebrew Bible credited YHWH, or Jehovah, with the ability to subdue the sea and tread upon the face of the waters, these New Testament miracles directly connect Jesus with the Jehovah of the Old Testament. This entry was posted in Eric D. Huntsman, Luke, Luke 8, Mark, Mark 4, Matthew, Matthew 8, Miracles of Jesus on February 17, 2015 by Administrator. This entry was posted in Eric D. Huntsman, Luke, Luke 5, Mark, Mark 1, Matthew, Matthew 8, Miracles of Jesus on February 12, 2015 by Administrator. This entry was posted in Eric D. Huntsman, Luke, Luke 5, Miracles of Jesus on February 12, 2015 by Administrator.